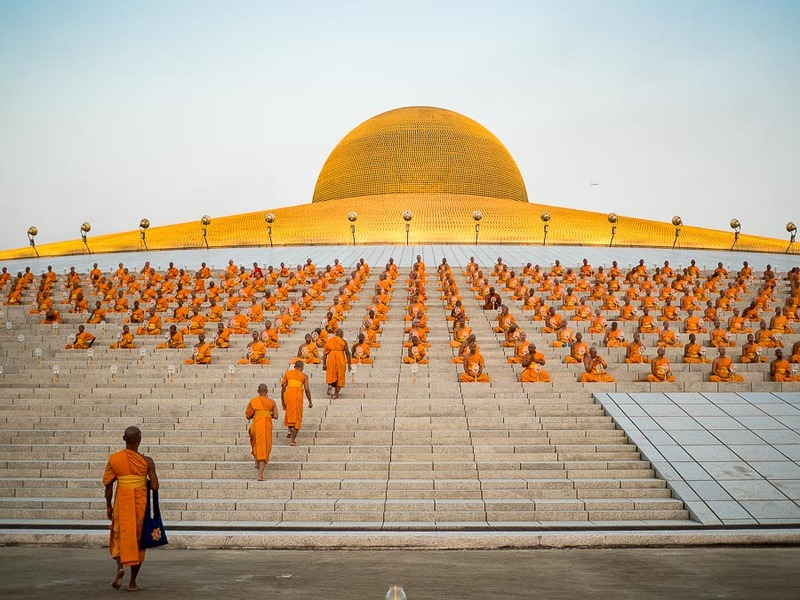 Buddhist monks walk to the pagoda at Wat Phra Dhammakaya to take their positions before the Makha Bucha ceremony. The full moon in February (the third lunar month) is Makha Bucha Day, one of the most important holy days in the Theravada Buddhist calendar. It marks four events that took place during the time of Lord Buddha. 1,250 monks convened at Veluvana Bamboo Grove without being summoned. 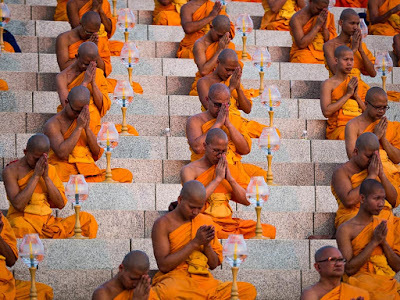 All of the monks were personally ordained by the Lord Buddha in what is known as ‘Ehi Bikkhu Upasampata’. They were Arahants possessing the six higher knowledge. The event occurred on the full moon day of the 3rd lunar month. People go to temples all over Thailand (and other Theravada Buddhist countries) to pray and meditate. 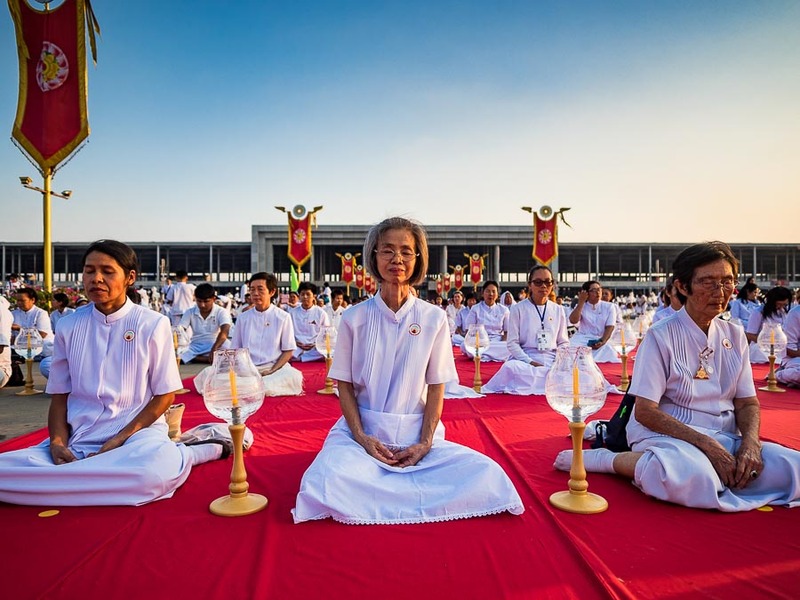 People pray and meditate in the plaza that surrounds the pagoda at Wat Phra Dhammakaya. I've been photographing Makha Bucha for years now. I even photographed the holy day in Phoenix when I wasn't able to be in Thailand. Most of the time in Thailand I've gone out to the Dhammakaya temple, about an hour north of Bangkok. Dhammakaya is a new sect of Thai Buddhism. It was founded in the mid 1970s and has attracted new followers at a dizzying pace. It differs from more traditional sects in a couple of ways - adherents actively proselytize and seek new members and followers believe that if they give to the sect, they will be rewarded in material ways (similar to the "prosperity gospel" preached by some evangelicals in the west). People and monks pray and meditate during the ceremony. Wat Phra Dhammakaya sits in a huge complex in Pathum Thani province. The main pagoda resembles a UFO ready to ascend into space. The temple is clearly visible from planes landing at Don Muang, the older of Bangkok's two airports. 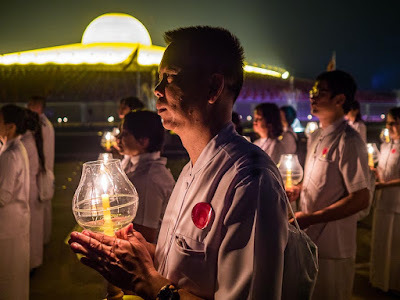 The Makha Bucha ceremony ends with candlelight processions around the pagoda. Monks process around the pagoda in the inner courtyard, while adherents, all dressed in white, process around the outer courtyard. Top photo, adherents, dressed in white, process around the pagoda while monks process around the pagoda (timed exposure, bottom photo). 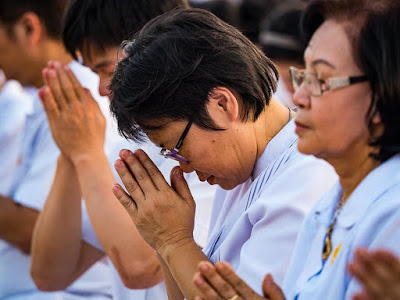 The Dhammakaya movement is not without controversy though. The Thai government has filed corruption charges against the abbot and has issued warrants for his arrest. They made repeated, unsuccessful, efforts to arrest him over the last year. 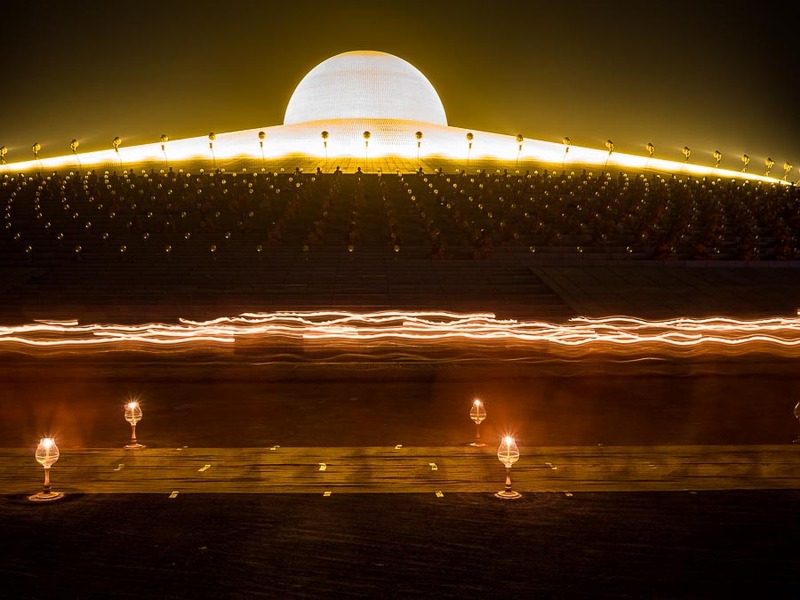 Monks sit around the pagoda while the full moon rises behind them. 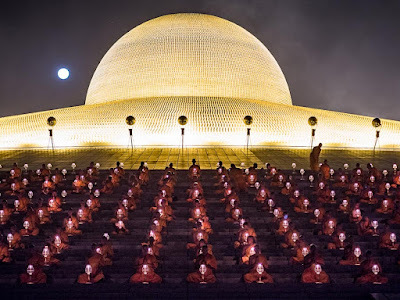 There are more photos of Makha Bucha and from Wat Phra Dhammakaya in my archive.